The Trac Navigation is located on the upper left corner. This search is one of the search options that will allow you to search students by name, ID, or visits by day, week, and month. When searching the Listing, you can use the semi-colon or the other Quick Search Option to utilize different fields in the search. The Student Search has different fields for students General Information, Visit History, Registrations and other fields. To locate the option go to the Student Listing then click on List Option and select Search. The Student Search displays different tab for the specific fields to search for. An example in the General Info Tab, John with in @ symbol has been entered in the first name field to find all john, Johnathon, Johnson, etc. The Student Listing will display all student that have John anywhere in the first name. 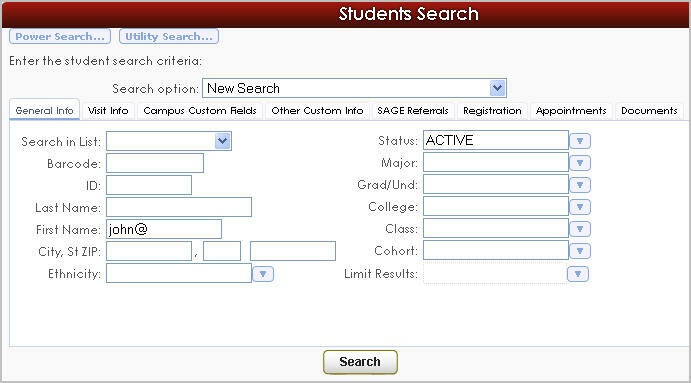 The Power Search has different fields for students and the option to add the students on a list. To locate the option go to the Student Listing then click on List Option and select Power Search. The Power Search displays different fields and the option to add more by clicking the Add Line link. An example is having the first field selected for GPA, the greater than or equal to 3.0 GPA and the next line is for Grade, A through C have been entered. These fields are looking for all students with a GPA 3.0 or higher and grades C or better. 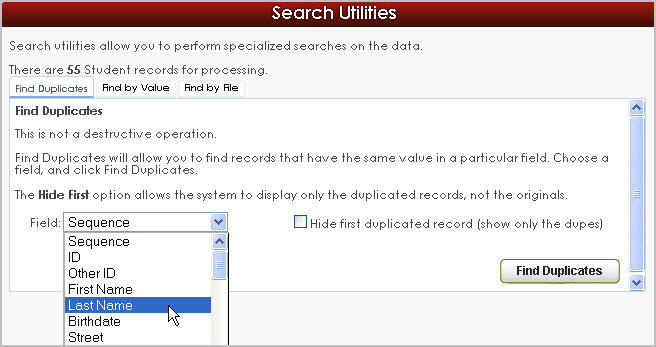 The Find Duplicates Tab will allow you to find records that have the same value in a particular field. Choose a field, for example the Last Names and click Find Duplicates. 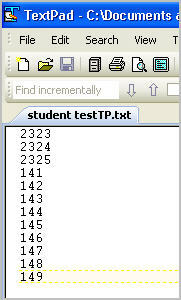 This will list all the student with the same last name in alphabetical order. 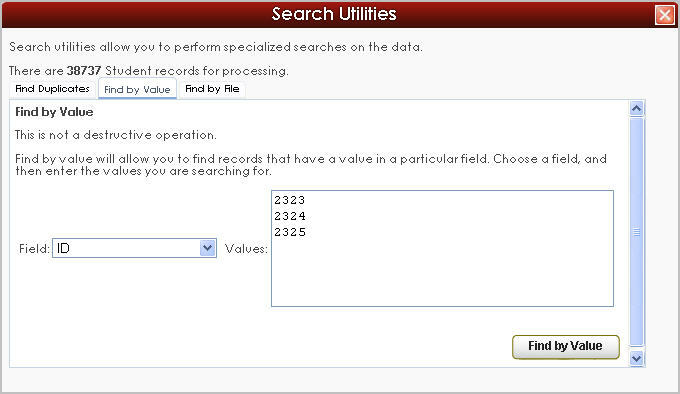 The Search Utilities will benefit when there is an external list of student and the Find by Value Tab can add those student by copy and paste or entered manually. For example in the Find by Value tab the field is ID and in the Value are three ID in each line with no space. This search will list the three ID in the Student Listing. 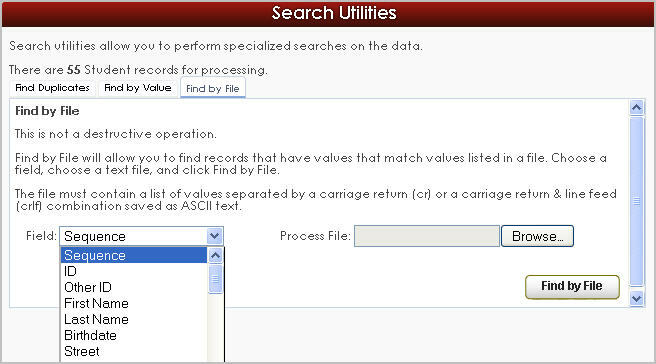 The Find by File Tab will allow you to find records that have matching values listed in a file. Choose a field for this example ID was selected, the text file that was added was a Text Pad Document, and click Find by File. The file must contain a list of values separated by a carriage return (cr) or a carriage return & line feed (crlf) combination saved as ASCII text. 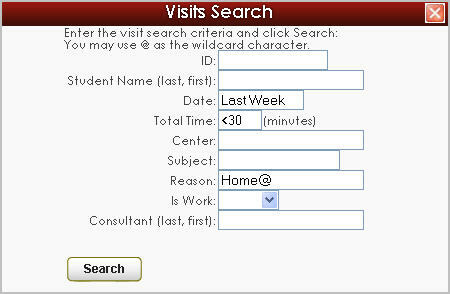 The Visit Search goes in detail of the student Visit History. To locate the option go to the Visit Listing then click on List Option and select Search. The Visit Search has different fields such as name, date, time, reason, consultant and other fields. An example visit search, the date ranged was entered to search Last Week, the time range is less than or equal to 30 minutes and for the reason home@. This search will list all the student that had a visit since last week for less than 30 minutes and for homework as the reason.